Pav Bhaji is an iconic street food from Mumbai that is now available in various versions across the country and even abroad. I love it and my favourite is from Sardar Pav Bhaji in Tardeo where the bhaji and the butter seem to be in equal quantities! That steaming hot plate of flavourful bhaji topped with a huge chunk of Amul butter, garnished with fresh coriander and finely chopped onions, and accompanied by soft ladi pav that's been lightly grilled with ... you guessed it, butter, is something that makes me weep with pleasure. It occurred to me that I'd never made pav bhaji myself. Innumerable posts on various Facebook food groups made me drool and when a vegetarian friend was set to come for lunch I had the perfect opportunity. The hubby was sent off to shop for the essentials and pav bhaji was on the menu. I didn't have time to make the pav at home but luckily there's a local bakery that makes lovely pav so we were sorted. Peel the potatoes and carrots, break the cauliflower into florets. Pressure cook these vegetables till cooked through. Chop the onions and green chillies finely. Chop the capsicum too. In a flat thick bottomed pan heat some oil and fry the chopped onions. Add the green chillies and continue frying for a few minutes till the onions are completely soft and begin to brown. Smash the ginger and garlic in a mortar and pestle. Add to the frying onions and cook it for 5 minutes. Chop the tomatoes and add to the frying pan. Stir well to mix and then add in the chopped capsicum. Let this cook for 5 minutes and smash the tomatoes with your spatula as it cooks. Add the spice powders and 2 -3 teaspoons of Pav Bhaji masala and mix. Add the boiled vegetables and mash it all in as best as you can. Add salt and some water at this stage. Use a potato masher to mash up the vegetables making sure there are no big chunks of any vegetable in the mix. You don't need to have a smooth puree, but a properly mashed mix works well. Add the tomato puree and more water if required, cover the pan and let it all cook for a few minutes. Now add around 50 grams of butter to the bhaji and stir it in. Taste the bhaji and add salt if required. If the mix is bland add more pav bhaji masala. Heat a tava or griddle for the pav. Take two pavs at a time, cut them into half horizontally but not right through. Butter generously and grill on the hot tava. Make a nice pile of grilled pav to go with the bhaji. To serve garnish the bhaji with fresh coriander and a big chunk of butter. On the side have finely chopped onions and lemon wedges ready to be added as per individual preference. Add green peas to the mix if you like. I didn't as the hubby is not particularly fond of them. To be honest, I didn't really miss them either. 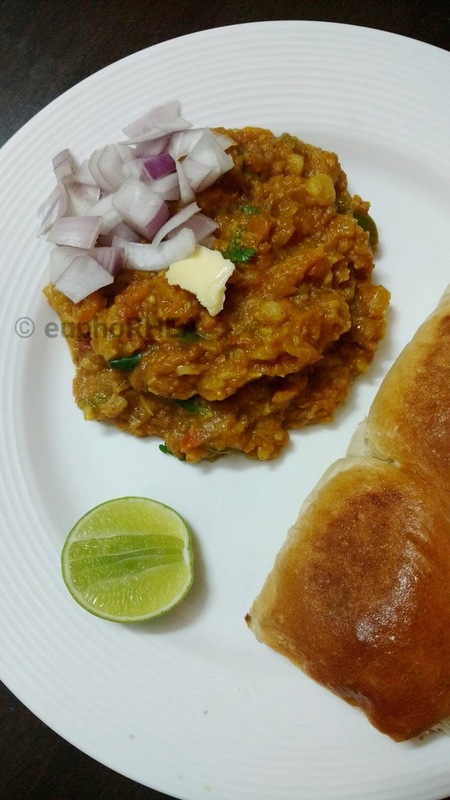 The thing about pav bhaji is that you can't be stingy with the butter. Ideally use good old salted golden Amul (that's what Sardar uses!). While you don't need to add excessive quantities of butter, you must be generous with it. The butter is the backbone of pav bhaji and without it, it simply doesn't work.